Colds, coughs and congestion can be eased with this Eucalyptus Chest Balm. Encourages a healthy immune system and brings relief to the symptoms of cold, runny sore noses and associated coughs and congestion. Organic eucalyptus, the Radiata type, is one of the most effective oils used in easing acute respiratory infections according to aromatherapy usage. It makes a good expectorant promoting good clear breathing. Other essential oils present effectively relieve stuffy sinuses and fatigue. The active blend is combined with sesame oil and organic shea butter to make a long lasting no greasy and moisturising balm. 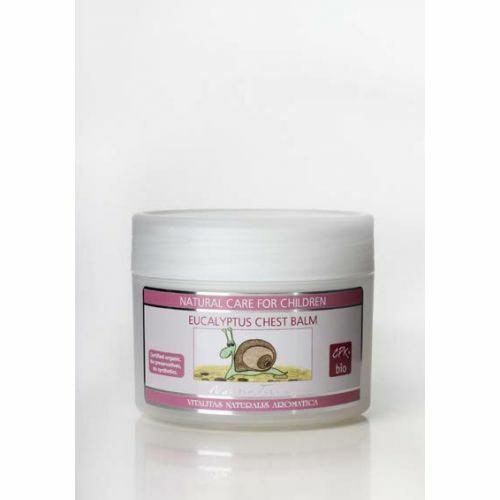 Rub the balm into the chest and back at least twice a day as needed. This balm can be rubbed gently into the feet at bedtime for overnight relief. Alcohol Humans have usted alcohol in various forms for thousands of years. It has been used for various purposes: drinks, medicine, and as a solvent for essential oils and other substances. Butyrospermum parkii butter Shea butter is extracted from the nuts of the Shea tree, which grows in the savannah of Western Africa. Cl 75810 Chlorophyllin (Cl 75810) provides a green colour. Chlorophyll absorbs light in the chloroplasts of plant cells and drives the reaction of photosynthesis. It uses the energy of light to fix carbon dioxide into carbohydrate and uses this to make plants grow. Studies have suggested that chlorophyll has protective, healing qualities. Eucalyptus radiata leaf oil Eucalyptus radiata essential oil is cooling, refreshing, and energizing. Lighter in smell than other eucalyptus types, it has many of the same supportive properties. Because it is relatively gentle and non-irritating, it is the preferred choice for children. Both orthodox and alternative medicine have recognized the many influential compounds of eucalyptus, making it a key ingredient in cough and throat medicines, as well as chest ointments. Pinus sylvestris leaf extract A potent anti-inflammatory extract with an ability to help alleviate skin conditions like eczema and psoriasis and boost the immune system. Sesamum indicum seed oil The light oil of sesame crushed from the seeds contains a high concentration of unsaturated fatty acids and antioxidants. In the tissues beneath the skin, this oil will neutralize oxygen radicals. It penetrates into the skin quickly. Styrax benzoin resin extract Possesses a sweet, warming, rich, vanilla-like aroma with resinous undertones which is warm and comforting. It is derived from the resin of the Styrax Benzoin tree. Its properties in Aromatherapy are its balsamic action and its use as an expectorant as well as being used to treat respiratory conditions such as bronchitis, colds and flu. Thymus vulgaris oil Providing a strong herbal smell the essential oil has strong anti- germ and cleansing value.